What is Yarn Twist in Textile? Twist is mainly the spiral arrangement of the fibers around the axis of the yarn. In textile industry, the twist binds the fibers together and also contributes to the yarn strength. It should be noted here that, the amount of twist inserted in a yarn defines the appearance and the strength of the yarn. The number of twists is known as TPI or Twist per inch. Count of yarn to be spun. Fineness of the fiber being spun. The softness of the fabric into which is the yarn is to be converted. There are two types of twist applied in yarn. One is S twist and another one is Z twist. What is S Twist in Textile? The fibers from a helical angle at the yarn surface when yarn is twisted in anticlockwise direction. This angle conforms to the middle part of the letter “S” and, therefore, it is termed as “S” twist. What is Z Twist in Textile? The fibers from a helical angle at the yarn surface when yarn is twisted in clockwise direction. This angle conforms to the middle part of the letter “Z” and, therefore, it is known as “Z” twist. The direction of twists and the twist cycle given in between a fixed length is an important condition showing the property of the yarn. The twist direction is either of right twist or left twist. From the figure we see that, left twist (Right hand twist), the lower end is suppressed and the upper end is wrung towards left and twists are given. In English, the threads in the same direction of the threads of right screw. Again from the figure, we see that, right twist (Left hand twist). Thus, the names given in Japan and the foreign countries are opposite. 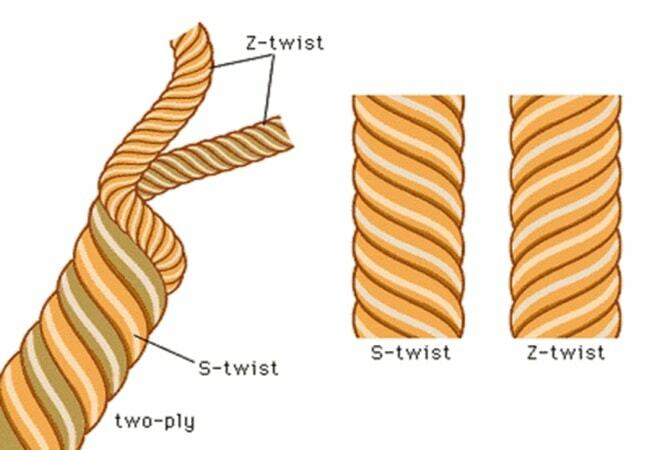 So, the right twist is also known as S twist and the left twist is known as Z twist. The degree of twist is shown in 1in or the number of twists in 1m. But, recently, it is shown generally with the number of twists in 1m. When two single yarns are combined to make a twin yarn, the twists given to the single yarn are termed as lower twists. After combining two yarns, when twists are given in the opposite direction of lower twists, it is termed as upper twist. What Types of Fabric Used in Garment Sector?